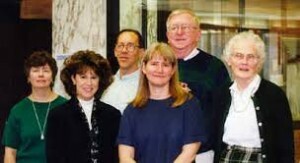 The Periodical Department in 1999. (L-R) Natalie Tomasco, Susan Markley, Bill Greene, Laura Hutelmyer, Jim Fox and Betty Lane. 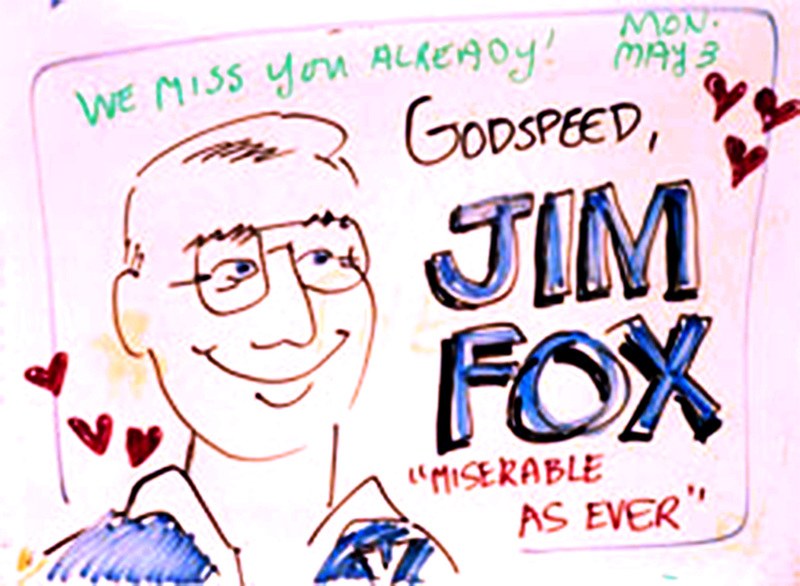 The Falvey Memorial Library staff was saddened to hear of the passing this month of one of our former colleagues, Jim Fox. 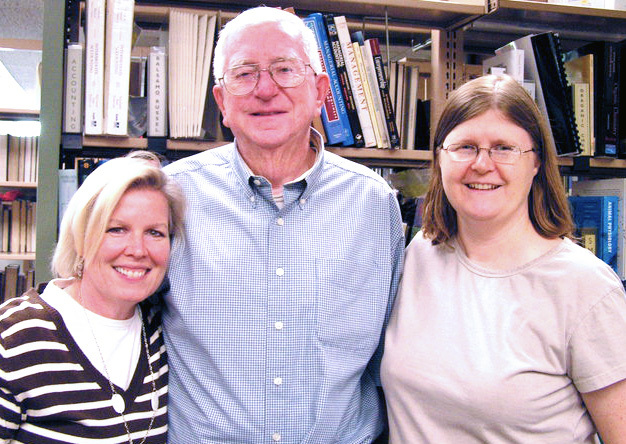 When he retired in 2010, the Library paid tribute to him by acknowledging his service with a blog post. Now we wish to take a moment to reflect on Jim’s lasting impact upon Falvey’s staff and share what he truly meant to us. As stacks coordinator, with Access Services, we relied on Jim to supervise the student workers in Bound Periodicals (the area now known as ‘Falvey West,”) and assist the students, faculty and staff in navigating the mysteries of the microfilm readers. No matter the complexity of the questions posed to him, whether it related to his immediate purview or to impact some general information, Jim’s hearty responses clearly demonstrated his warmth and desire to be of assistance. Jim and I were hired on the same day in August 1996. We split the job of Microforms Supervisor. I worked Monday-Wednesday-Friday and Jim did Tuesday-Thursday because he taught as an adjunct at Penn State and LaSalle Universities on the other days. He always shook “hands” with his elbow. He used to ‘verse’ the international students on the importance of St. Patrick’s Day. A lifelong historian, he was trying to get an article published only a month or so ago. His family told me (at his memorial service) that he loved his job here at Villanova. Outside of work, Jim Fox and I shared a common bond. We both coached girls basketball. I learned so much about coaching basketball from Jim. On break time at Falvey, I would often go to Jim for advice. He taught me fantastic offensive drills and strategies for defense. But, the most important lesson Jim taught me was to give every player a chance to shine. Jim told me, “Each player has their own unique talent. It is the coach’s role to see that talent in the player and then give them the opportunity to display it.” I had a very successful coaching experience as a result. Our success was not measured in wins. It was measured in the confidence and pride that resounded within the players hearts. I will remember Jim as being a very kind, thoughtful, funny person. I’m so glad I had the opportunity to work with him and call him friend. I never really paid attention to Villanova’s basketball schedule. With Jim’s arrival on campus, he introduced me to the strong basketball rivalry between Villanova’s Wildcats and St. Joseph’s Hawks. It was from Jim I learned key phrases like, “Hawk Hill” and the “Holy War.” Seeing Jim around brightened my day with just his simple ‘hello’ and ‘how are you’ phrases . . . a humorous man who was conversant on many topics. Jim never believed that I was truly a Villanova University graduate because I was unable to recite the lyrics to our Alma Mater. My response was that I spent my four years in the band playing the trombone, so I never had to actually sing the song. He would not hear of it. I guess when you’d taught high school as long as Jim did, you ate excuses like that for lunch! Working alongside with him in Access Services, I could be up to my you-know-what in ILL requests and alligators, but hearing Jim gruffly respond “miserable as ever” each time someone asked “how ya doin’” – even from across the room – never, ever failed to make me laugh. He also reproached me occasionally in my duties as the Falvey whiteboard artist, if I chose to honor a rock or pop star instead of the Saint of the Day – and he always knew which saint that was. The day I drew the Phillies’ Darren Daulton instead of Thomas Paine, I received an “anonymous” Letter from the Management that “officially” demoted me. It came complete with letterhead and wax seal. True story. Of our Blue and White. Jim was so great to work with. He will be missed! Thanks for a great article. Jim was such an asset to Falvey and to the University. Love your blog Ladies! Very funny in some parts!! 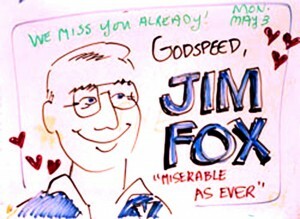 You were so lucky to work with Mr. Jim Fox. Love the character drawing! Friend of his son Jim Fox, who forwarded this to me!